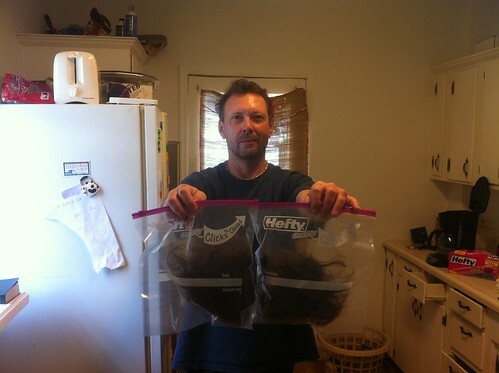 Before he leaves for boot camp I will cut off and bag the hair that he 'combs' only with his fingers. No way will I allow it to be swept into the compost depository by the Navy barber's assistants.. the ones who scored 42 on the test. THAT I wrote here February 22nd, 2011. This last Sunday... the time came for action. 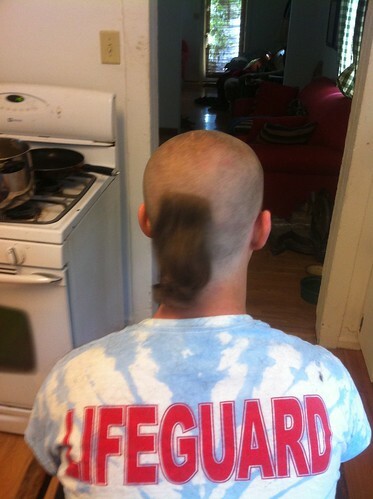 First step was the double Mohawk..
Then reduced to the single, front to back, wide Mohawk. 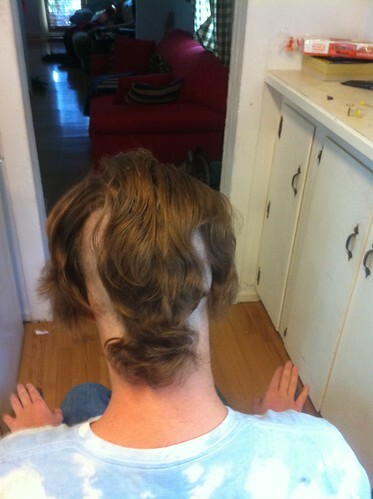 The OZ hawk. We're off to see the wizard! Here, I tricked him. Told him we were all finished. One for me, one for his mother. You were both very brave. Smiling here ... for a dad with a heart of gold. Everything Joan said. Cover, please! Young girls in our culture have a clear moment when they pass from childhood to womanhood. Young men don't have a similar moment, to their disadvantage it seems. This surely does the trick, an intense and beautiful boy to man ritual, the father shaving away innocence one swipe at a time. Yowsah. 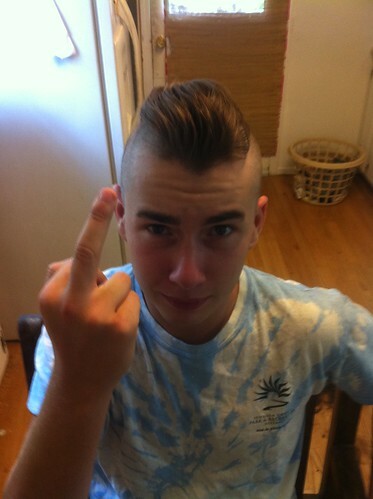 The double mohawk must trend soon! This was so charming. I loved the" missed a spot" pic the most. First post of the day, minute, hour. Izz all good. What a good looking kid you've got there. You too are quite handsome. Awwwwwwwww . . . this must be difficult for you. P.S. Your "new" house looks okay! omg. 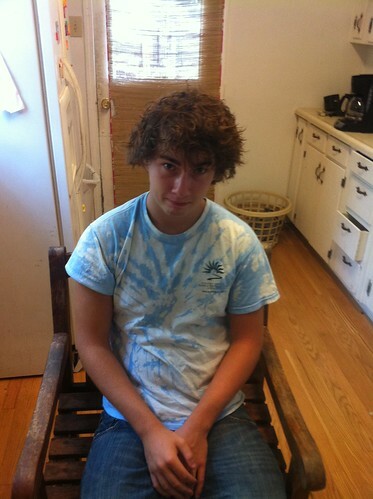 Well, he's still just as cute as he was with curls. Maybe cuter. The shaved look is cool. Who doesn't want to look like Vin Diesel? Walter White looked infinitely cooler when he shaved his head. It works. Thanks for sharing this with us. It must have been kind of traumatic for both of you, but you made it fun too. Also nice you made a bag for his mom. *sigh* We're all thinking about you on this journey. Excellent pictures. You need to make a commemorative throw pillow from that hair. I love this kind of stuff - small, sweet family moments which would have been lost to memory if your hadn't documented and shared. It was a perfect balance between humor and sadness, photos and words. 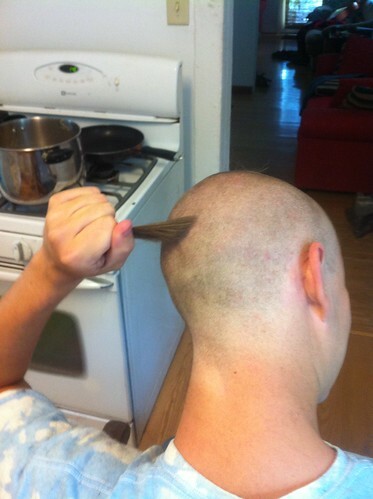 Good luck to your son... tell him to keep his freshly shaven head down. I would have been bawling the whole time. You're a great dad, and Eli's a great kid. Eli becomes a new man. How does just a buzz give that impression, I don't know, but it seems true. I suspect it is true. That was an oddly powerful post. You're a great dad. Eli's a lucky young man. Hi, there, tr ig. Sorry for your recent troubles . . . but it's hard to keep a good man down, right? Remember baby's first haircut? Now this... the love you have for this young man inspires awe. Good luck Elie and godspeed. Oh dear. So this makes it real. Keep telling yourself it was therapeutic and it might help - a little. Thank you. It brought back my memories of off to the Air Force. Best of luck to you and your son. Aw. Well, he sure looks more like a Military Man now. Cute post. Touching, too. 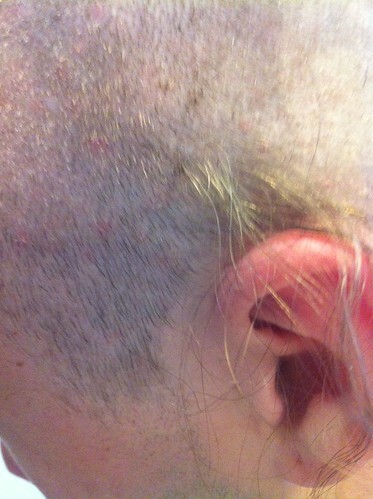 I hate it when you shave your head & there's all these weird bumps & you have to wear a hat til your hair grows back. He's got a great head. Hardly know what to say. So many moments captured here. Moments of trust. Moments of love. Shared by all who visit here. I keep coming back. I keep welling up. We have sons about the same age so it resonates I guess. And you and Eli mean a lot to this OS family. As someone said, this is powerful. You're pretty handy with those shears. I have a couple of poodles you can do now. 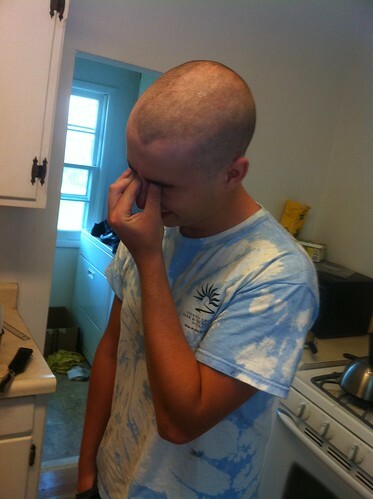 Damn it, another 'wild hair freek' goes off bald into the Military!!! ELI!! DON'T LET THEM CHANGE YOU INTO...whatever they change you into the military, oh yeah, a man or something!! PFFFT!!! Beautiful yet hard to read. I did the same for my son a few years ago. Good. I wish the best for Eli. 3 wars and more on the way. Good luck Mi amigo! I always miss that spot too? High and tight would have been a good style (like the wide mohawk pic but shorter length), but ya know what? He looks just as handsome and a bit dangerous with the shaved head. It could be a good look for him once he gets used to it.